Looking for that ultimate romantic vacation or honeymoon? 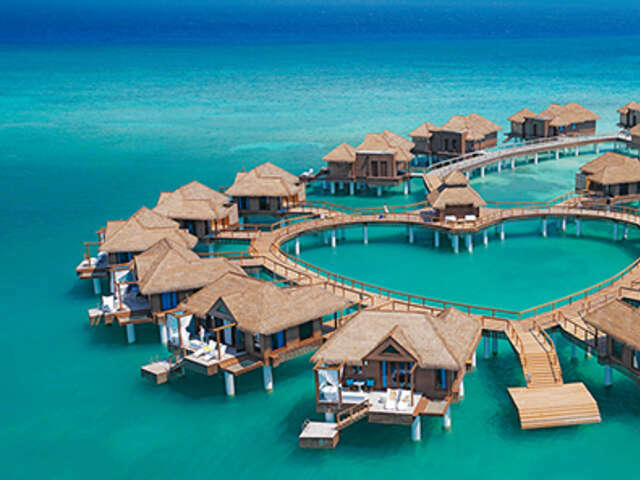 Over-the-water bungalows are over the top! An expansive patio features Sandals signature Tranquility Soaking Tub™ for two, an over-the-water hammock, outdoor shower and a suspended patio with swim-up platform, while the interior boasts sea-through glass floors that guarantee undersea views, a king-size bed, and a spacious, spa-style bathroom. Glass vision floor panels and lit water with underwater views at any time, day or night. Inside, is your personal smart TV, with a large ceiling fan and bathrooms with double sinks, a large back-lit mirror adorned with mosaic tile, and a walk-in rain shower. Step outside on the private patio with an extended sun deck, outdoor shower, sun loungers, and a bistro set for two. And your own private butler will be on hand to meet your every wish and command, including 24 hour room service, and a private water taxi to take you to and from the resort.